Not much is known about the origins of the Finnish sauna but it is commonly believed that saunas, or rooms that resemble modern-day saunas, have been around for thousands of years. In more recent times, from the 16th century onward, Finns (and Scandinavians) have used saunas as bath houses. The bathing process would typically involve gently beating one another with branches and using cold water to cleanse. The sauna later evolved into a place that could be used to socialize, to eat, to discuss important matters and to even give birth. What has made the sauna so popular in Finland is that it allows people to escape the cold weather quite easily. It also helps that Finland, and other countries in Scandinavia, have always had a large supply of wood which is used to not only warm up saunas but also to build them. The modern-day Finnish sauna very much resembles what most people think a sauna is. A Finnish sauna is typically a room, or separate building, with wooden walls and a wooden ceiling. A stove, kiuas in Finnish, is used to heat up the room, powered by electricity, wood or gas. 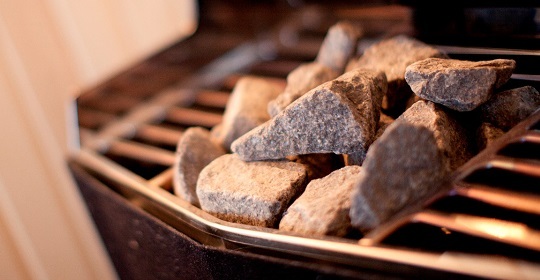 Sauna rocks or stones cover the top of the stove to help spread the heat across the sauna room. The process of pouring water on sauna rocks may sound simple but actually requires a bit of skill and experience. Too much water and it will cool down the stove and can potentially damage the rocks. Too little water and the room will not warm up as quickly as desired. The best way to do this is to use small doses of water at regular intervals. The temperature in a Finnish sauna typically ranges from 66 to 88 degrees Celsius, or 150 to 190 degrees Fahrenheit. After a sauna session, it is common to cool off and wash, often outside in the much colder temperature. Swimming is also often done after a sauna session. Also note that it’s very normal to enter a Finnish sauna in your birthday suit. While a small towel is acceptable, being naked in a sauna in Finland is the norm. When cooling off outside the sauna though, it’s expected to cover yourself with a towel. 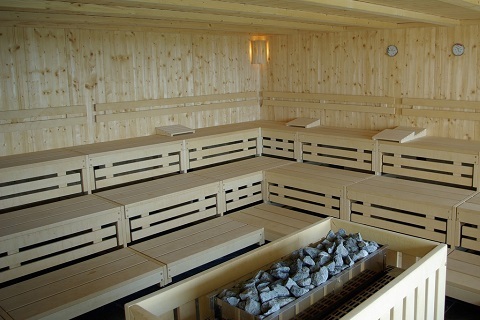 You will find lots of public saunas in Finland. Gyms, hotels, swimming pools, they will all typically have a sauna in the complex. Small at-home saunas or private sauna cottages are also very common. The sauna truly is an integral part of the Finnish lifestyle, and the average Finn simply cannot imagine a life without a sauna nearby. This also means that the Finnish treat a sauna with respect and will always use a sauna in an appropriate manner. As such, sauna etiquette is considered very important. Saunas offer great benefits for both our physical health as well as our mental health. The Finnish have embraced sauna use as a major part of their lifestyle. Fortunately for the rest of us, the popularity of saunas has steadily increased in recent times with Finnish style saunas popping up in hotels, gyms and spas all over the world.